Andhra Pradesh EAMCET 2012 Results Announced today at 6PM. EAMCET 2012 entrance exam held on May 22nd. 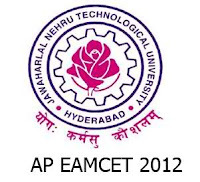 EAMCET is one of the top competitive exam in Andhra Pradesh.EAMCET 2012 – Engineering Agriculture and Medicine Common Entrance Test is conducted by JNTU Hyderabad on behalf of APSCHE. This examination is the gateway for entry into various professional courses offered in Government / Private Colleges in Andhra Pradesh.